Illustrated by sixty female artists from every corner of the globe, Good Night Stories for Rebel Girls introduces us to one hundred remarkable women and their extraordinary lives. Empowering, moving and inspirational, these are true fairy tales for heroines who definitely don't need rescuing. 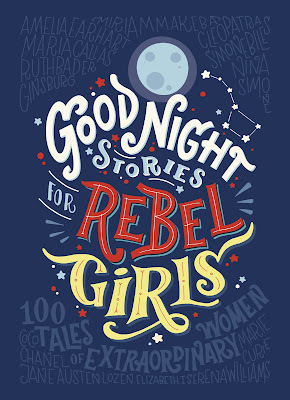 Good Night Stories For Rebel Girls is inspirational. One hundred accomplished women from all around the globe who are shattering stereotypes and forging pathways for generations of women pushing against the glass ceiling in our patriarchal societies. Wonderfully illustrated by sixty female artists representing our diverse and cultural lands, illustrating women as distinguished and accomplished. As tenacious. 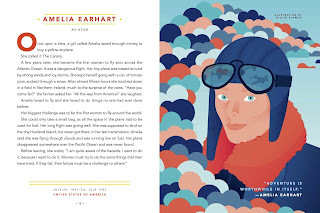 Amelia Earhart, an aviator from the United States and the first woman who achieved the first solo flight across the Atlantic Ocean. Coy Mathis an elementary school student and transgender girl who challenged the education department. Irish pirate Grace O'Malley refused to surrender to the English rule whilst Jacquotte Delahaye who commanded a legion of pirates with her girlfriend and fellow pirate. Kate Sheppard a New Zealand suffragette. Loren an Apache warrior among men. Mae Carol Jemison an American engineer, physician and NASA astronaut. Each page is dedicated to a brilliant woman who has excelled in her field of expertise and accompanied by a bright and wonderfully interpretative illustration. The magnitude of women featured throughout Goodnight Stories For Rebel Girls reflect our communities, celebrating ethnicity, gender, religion, sexuality, disability and socioeconomic diversity from the Republic of Mauritius, India, Sudan, Cuba, Italy, United Arab Eremites, Canada, Russia, Burma, Mexico, Somalia, Haiti, Pakistan, Saudi Arabia, China, Columbia, Kenya and western countries such as the United States, United Kingdom and of course, Australia and New Zealand. Good Night Stories For Rebel Girls is a magnificent. A celebration of feminism for children and adults to inspire imagination and dream the impossible as possible. This is a book I would love to get my hands on. I could always use some inspiration from girls in history did amazing things! It's absolutely brilliant. I read it from cover to cover but a few of the remarkable women I adored their stories. Like Jacquotte Delahaye who was a pirate commanding her own fleet alongside her girlfriend. This needs to be made into a young adult novel. 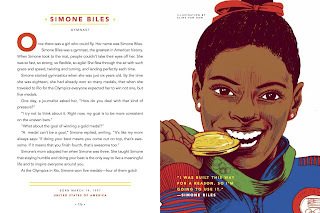 It really is Joy and not only are the remarkable women from all over the world but also the female illustrators who brought their portraits to life. Children, both boys and girls will love this one Tasya. The stories have been writing with children in mind and even adults will be captivated by some of the stories within. Some of the women I hadn't heard of either but won't forget in a hurry. They have. We have too. 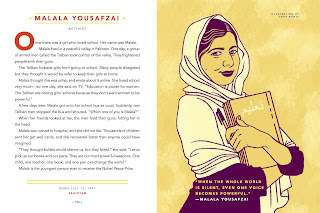 I would have loved this book as a young girl, listening to women doing wonderful things out in the world and paving the way for girls everywhere. Children will really enjoy this one and it's a great way for parents to interact with children, following up on their favourites and learning more about each woman beyond the pages. This sounds amazing. I'm sure I'd learn about a lot of new people too. I love that there are great illustrations throughout as well. Thanks so much for sharing! Every girl - and boy - needs this one, it sounds like. They do. I really hope parents, grandparents, aunts and even librarians will purchase this one for children. It's a wonderful read and despite the title, such an important read for children to celebrate remarkable women from all over the world. It truly is Christy and perfect for giving to little family members for special occasions too. Damn. I need this book in my life. You do Joy and for your lovely little ones as well. Teens and adults will enjoy this one as well, it's really a great read. Thank you for this book. I had not even heard of it previously. This is fantastic . It would make a great birthday gift for little girls, don't you think? It certainly would! It's so beautifully presented as well. A nice little motivational message in the front and you've got a gift that children and teens will love and parents will love that it's educational. This would be prefect for your gorgeous little one, the illustrations are so bright and lovely and the stories per page are aimed towards children specifically as well. Perfect for gift giving too. My heart absolutely sung on seeing this book for the first time! Girl Power!! I will be teaching my boys to treat everybody as equals and books like this make it easier to prove how badass us girls can be! It really does start at home doesn't it Sarah. I hope the title doesn't deter mother's with young boys though because it's very much a children's book that anyone can enjoy, just celebrating remarkable women. And even for women, it's such a source of inspiration too Casey. Some of these stories about these remarkable women need to be told, especially the Irish pirates and their girlfriends. I would give an arm and leg for a young adult author to write that one. Oh I love the sound of this! And what a gorgeous book it is too! It's absolutely beautiful. I would have loved something like this one as a child or even early teen. It'll make brilliant gifts this coming Christmas. Holy cucumbers, this is amazing. I love that they did illustrations and did not just include photographs. Something about that makes it 94385793 times better. I need this in my life. I think everyone needs this in their life, especially the young girls of this world. It really is a wonderful celebration of women. 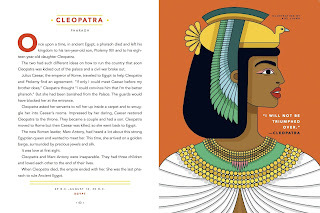 Not only the women of history but the two ladies who created the book from the Kickstarter funding, the remarkable female illustrators. It's brilliant and even more so knowing how many women were involved in creating the book. It's absolutely brilliant Blessie, I hope you enjoy it. This is everything we've been asking for! I am definitely going to get myself a copy as soon as I can. It's absolutely brilliant, inspirational and educational. There should be a copy placed in every school library. We so need more books like this! !